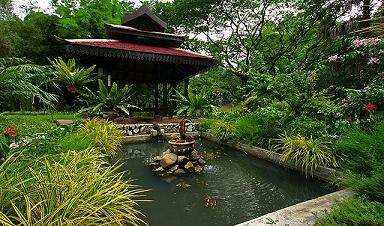 What could be more enchanting than the Kuala Lumpur Lake Gardens? I'm telling you now...surely not much. Also known as the Taman Tasik Perdana if you speak Malaysian, this fascinating garden comprise an enormous and gorgeous preserve. Kuala Lumpur is the area formerly known as the "Padang". The colonial British used it as a cricket ground. 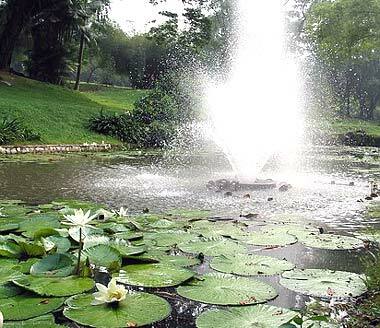 The Kuala Lumpur Lake Gardens are built around two beautiful lakes in the heart of the city of Kuala Lumpur, and was made official on May 1, 1975 by the second Prime Minister of Malaysia Tun Haji Abdul Razak Hussein. So it's there for all the city slickers who have no idea that any animals besides the dog, cat, canary, goldfish, parrot, pigeon, mouse, rat, or "city bug" even exist to go visit and discover that there are at least 2,997 other species of birds, along with deer, rabbits, chipmunks, squirrels, lemurs--oops, sorry, those are children--and butterflies. Walking in the Kuala Lumpur Lake Gardens, the city slickers of Kuala Lumpur will also discover flowers if they walk to the north. Yes. Gorgeous flowers, too. There is an orchid garden with over 800 species of orchids--the sexiest flowers in the world, you know--and the "Bunga Raya" or hibiscus garden. The Bunga Raya is the national flower of Malaysia. The hibiscus is also the "Queen of the Tropical Flowers", and since Malaysia is a tropical nation that really makes a lot of sense, doesn't it? The Kuala Lumpur Butterfly Park is a little miniature rainforest that's home to over 6000 butterflies including over 120 species (there are also a few species of moths here who pretend they are butterflies). There's also a souvenir shop and an insect museum. The Kuala Lumpur Bird Park contains the planet's largest walk-in free flight aviary and is home to over 3000 birds comprising over 150 different species. The Kuala Lumpur Boathouse gives you at least an hour of family fun time on the shimmering lake, which apparently wasn't there before but was artificially created just so it could have the Kuala Lumpur Lake Gardens built around it. Talk about a purpose-driven existence. To the west of the Orchid Garden, across Jalan Perdana, you'll find the Deer Park, where spotted deer play around in the bushes and practice eating gardeners' crops. Believe it or not, deer are quite common in Asia. Now who woulda thought? I mean, Asians are always talking about eating fish and rice, but when do you ever hear of Special Chinese Venison? Right outside the Garden you'll find the ASEAN (Association of South East Asia) sculpture garden. Can't miss it...it's near that big giant Mosque. This place showcases many of Asia's best artists. No, we don't ALL do Anime and Origami. But the most outstanding features of the beautiful Kuala Lumpur Lake Gardens are the snack and drink shops that you'll come across. Hey, taking in all that this place has to offer makes you thirsty and hungry, and the lemurs are getting restless!